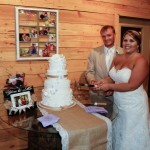 Your wedding day is a celebration that should include all of your loved ones. Your best friends and family come. Your fourth cousin, who you’ve met twice, may even come. So why not include someone who loves you very much and who you’re with everyday: your dog! 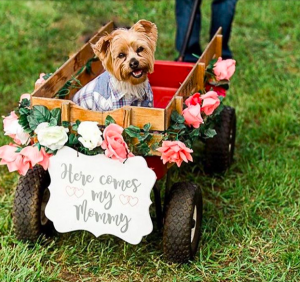 There are a few things to consider and many different ways to involve your pup in your wedding. First of all, you want to make sure that your venue even allows animals. Some venues have rules about such a thing and it doesn’t hurt to clarify. It would certainly be disappointing to assume and then have to send your dog home on the day of. 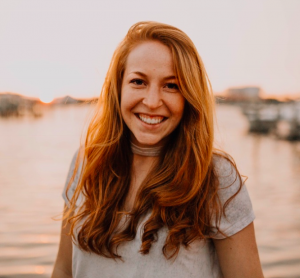 In addition, you may want to talk to the venue coordinator to see about any suggestions or other details of your dog’s stay on the wedding day. Side note: If this initial question is answered with a “no,” you could always involve your dog in other aspects of the wedding. For instance, you could incorporate your pet into the engagement pictures, the wedding invitations, or even the cake. Get creative! 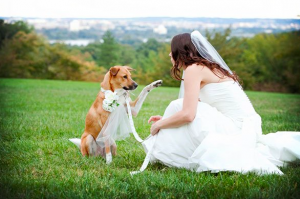 In addition, it is important to consider the logistics of having your dog at your wedding. For example, you want to think about what your dog will be doing throughout the whole day. If the venue is far away, you may want to find the best way to have your dog travel to you. Find a good friend or even hire someone to oversee the role of traveling with your dog and making sure they are fed, tended to, and loved throughout the day. You must also consider whether or not your dog would enjoy the role you would like them to play and the practicality of it. Would your dog feel constricted or at ease while he/she is waiting for their time to shine? How would they handle sitting through the ceremony and reception? This factor may depend on who is taking care of your dog while you are getting ready and partaking in your wedding day duties, but it also might depend on the role you give your dog. You must consider if the role fits your dog’s personality and training level. Another thing to consider is informing your photographer! You should definitely let your photographer know about your plans for pup-involvement. They can brainstorm picture ideas prior to the wedding, that will be perfect in capturing your dog and the newly wed couple together! It also helps warn the photographer of potential dog photobombs and helps them prepare to capture some good candids of your dog being goofy! 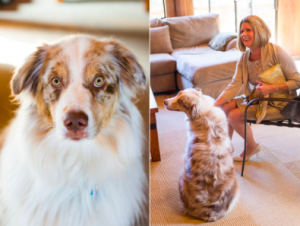 In addition to telling the photographer, you also want to inform guests about your furry friend’s attendance. In case of allergies or other situations, it is important to have this on the wedding invitations or wedding website. Let’s first think about the basics of finding your dog’s perfect spot in the wedding: ceremony or reception? Although your dog may LOVE people and is, in fact, very well-behaved around people, receptions tend to get a bit loud and may turn chaotic if a dog is involved. With loads of food and dancing, your dog may be in heaven but it may be overwhelming. On the flip side, while a ceremony may seem too structured and serious for your pet, it may be easier to instruct your dog in this environment versus a reception. 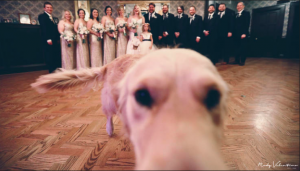 If you choose to allow your dog to be a part of the ceremony portion of your wedding, you can incorporate them into your special day in a variety of ways. If your dog is a huge people-lover, they may enjoy greeting guests as they enter the venue. You can ask a family member or friend to be your dog’s caretaker in the beginning to ensure safety and enjoyment for all. Add a welcome sign next to or hanging from your dog’s mouth and your guests are bound to love your furry friend! If your dog is well-trained and you would like them to have a more active role, they can take the place of a ring-bearer. Attach the rings to your dog’s back or collar and have someone either walk your dog down the aisle or call your dog to the stage. If you are slightly worried about your dog’s place in this role, there are other ways to involve your dog that don’t require such valuable rings to be in your dog’s possession. 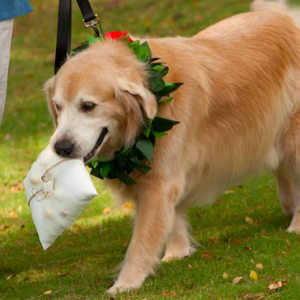 For instance, you can create a role similar to a ring-bearer for your dog. Instead of carrying your expensive rings in his/her mouth, you could customize a message board that your dog could carry or even just dress him/her up in doggie wedding day attire. Call them up and have them stand with your wedding party as extra support for you and your partner. 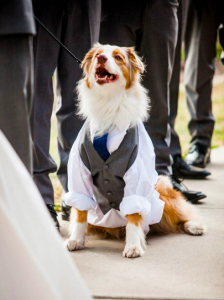 Maybe have your dog come before the bride walks out as a “here comes the bride” preview! 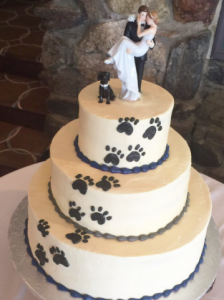 All in all, there are many ways to incorporate your pet on your special day, but you know your dog and his/hers abilities better than anyone. If you want your dog to be a part of your wedding day, it IS possible and may be the finishing touch to your perfect wedding day! 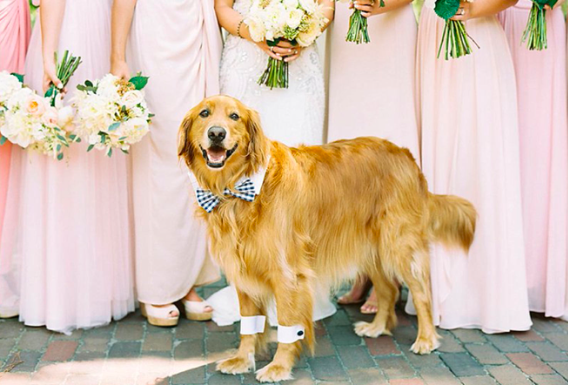 After thinking about the possible considerations and deciding on your dog’s perfect role, you are now ready for ALL of your loved ones to be at your wedding!